Here’s the recipe for the spicy sweet red sauce for falafel that I’ve been promising but neglecting to post. 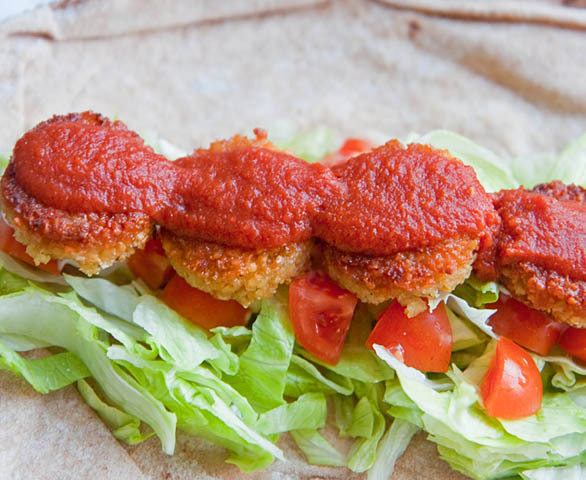 How perfect are these falafel? Bring all of the ingredients to a boil in a small saucepan. Reduce the heat and simmer uncovered for 30 minutes, or until it thickens a bit. Allow it to cool, then puree it. If it’s too thin for your tastes, you can thin it with a bit of water. You may also want to add a bit of salt, but I find this depends on which brand of tomatoes I’m using. Play with the sugar/chili amounts to suit your taste, I like a good spicy-sweet combo.I’m a condiment junkie, so I usually use this along with a creamy garlic kebab sauce. Yum! Try it with falafel made with bulgur or falafel made with breadcrumbs. Have I mentioned how much I love falafel??? Seriously, what an invention!!! Oh my word! That looks so good, Sage! I really need to make that. OMG, I must eat that right now.